The band Haim may have stepped onto the music scene in 2012, but its members have been playing together for literally their entire lives. The Los Angeles-based group is composed of the three rock star Haim (rhymes with ‘time’) sisters: Este, 27, Danielle, 24, and Alana, 22. Born into a musical family, their father placed drumsticks in the girls’ hands when they were toddlers, and they’ve been playing non-stop ever since. The sisters have been recording together for the past five years, and released their EP, Forever, in February. Their sanguine yet dreamy sound is a blend of classic rock, 80’s R&B, and pop, with a bit of folk melody in there as well. They’ve toured with Mumford and Sons and recorded a track with ASAP Rocky, and are heading out on tour with Vampire Weekend later this month. With an album dropping early this summer, the band is well on its way to mainstream success, staying characteristically humble in the process. I spoke with Alana, the youngest of the three Haim sisters, who said she’s ‘pinching herself’ with disbelief. I’ve heard your parents are very musical. Tell me a bit about your childhood and how music became such a big part of life for you and your sisters. My parents were in a band with another couple when we were babies. They would play at Club Med, so Club Med would pay for our family vacations. We didn’t have a lot of money, so we couldn’t really go to these exotic places, but our parents would play in Mexico and around the U.S. When we got a little older the gig fizzled out, but one night my dad woke up from this dream—like Moses, or Jacob who woke up from the dream?—It was Jacob. In the dream he played music with us, and soon after that we just started playing with our parents. Our first song we learned was “Mustang Sally” and then it just brewed from there. Our first gig was at Canter’s Deli in L.A., and I think I was about five or six. Every weekend we would practice; we’d play country fairs and charity gigs. My parents never let us play for money, but believe me if we got money from the amount of gigs we played, I’d be rolling in dough right now. I wouldn’t have to be in Haim, I’d be chilling in Barbados. So one day you all just decided to start a band? A couple years ago we kind of just broke off and started our own band. We had begun by playing covers together, and then when we formed Haim we started writing songs. We always basically knew we wanted to start a band together, we just never really said it out loud. It was an unspoken thing that one day we’d just try playing music together. Finally we were like, ‘We probably should do it, we’re getting kind of old.’ So we wrote a song in a day, probably the worst song ever, but it was a song. Then from there we just kept growing and playing shows out in L.A., and now I’m here! 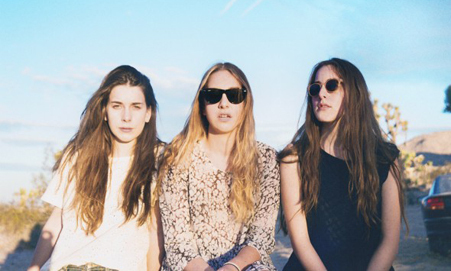 It’s almost been seven years since Haim started, so it’s pretty crazy! There have been comparisons made between you guys and artists like Fleetwood Mac and John Waite. Do you find it annoying when people try and categorize your music or do you find it flattering? I always find it flattering. How can I ever say, ‘Ugh, oh my god, we sound like Fleetwood Mac.’ I’ve wished on every star that I end up as successful as Fleetwood Mac. I grew up listening to Fleetwood Mac; I’m obsessed with them. I never get mad about those things, I just think its hilarious because when I listen to my music I hear harmonies, so maybe that’s the Fleetwood Mac vibes. I think we’re such different songwriters, but I feel like people need to categorize bands. Every band has been ‘the next this’ or ‘the next that’, so we’re just kind of following the path of being a band. I welcome any comparison. I think they’re always hilarious and amazing, so I’m down. I saw your tweet the other day asking for album name suggestions. Did you get any good ones? Oh my god! That was the best and worst idea I ever had. I think my favorite was ‘Haim a little teapot.’ A lot of people have play on words of Haim, like ‘Scene of the Haim’ or ‘Haim Time.’ I think it was funny because a lot of people still don’t know how to pronounce our name. We can literally see the difference in rhymes from people who knew our name and didn’t know our name. Doesn’t Haim mean ‘to life’ in Hebrew? Maybe you could do a play on words with ‘to life,’ or something like that. It’s all welcome. There are some really good ones we have that involve the word life. I’ve always had a really strong connection to my last name. I think it’s very powerful. Of course! We have to go to Israel for the occasional family wedding. There are some crazy Israeli weddings! I love Israel; I think it’s such a beautiful place. A lot of people think ‘Oh you go to Israel because you’re Jewish.’ I encourage my friends who aren’t Jewish to go to Israel because it’s such a beautiful place, and it’s such an important place. There’s so much history there, and it doesn’t matter what religion you are. I’ve always felt like a deep connection to the country. Especially living in LA, we don’t really have any history. Our history starts with Hollywood. Which of your sisters writes most of the songs, or is it mostly collaborative? Our song writing is very collaborative. Usually one of us will come in with one element, whether it’s a guitar line or a melody. We just all come together and whatever inspires us takes its own journey. We don’t have a set formula yet, so whatever works that day, we kind of just go with it. It must be fun to collectively share your musical experiences with your sisters, like if one boy breaks your heart, I feel like you may all hate on him equally. Do you think this shared feeling of heartbreak or love heightens Haim’s emotional performance? Oh yeah, definitely. And there have definitely been some moments that I regret singing songs about my exes. I’ve written songs and sang them to them after we break up, which I mean, is horrible. I had way more angst as a 16-year-old than I do today. I’m more poetic with it now, but it was very different back in the day. It’s definitely gotten better. We all tend to break up or we get broken up with at the same. Once it happens to one of us, it usually happens to the other. It’s been the perfect time to write a record. Having two of my own, I know sisters are usually pretty similar but also really different. What’s your dynamic like? It seems like Danielle’s a little reserved, and you’re more outgoing. Can you tell me about your personalities? We are three puzzle pieces, really the counterparts to each other. Este is the first child and is the rambunctious, always wants attention-type of person. Not in a bad way, she’s just always been super outgoing and has always loved talking to people—she’s been that way since birth. Having a sister like Este and coming into the world you have to be quiet, so Danielle was always the sweet, internalized child. The way she is the onstage is the way she is in real life. I’m a weird mixture of both of them. I’ve taken the good things from both. Its easier being the baby because you see your sisters going through the craziest times in their life and you make a mental note like ‘OK, when I’m 16 I won’t make that mistake.’ I’ve seen my sisters make mistakes and I’ve been able to not do that. It’s easier for the baby! Agreed. What’s your favorite spot you guys have played and what’s your dream venue? AH: We were on tour with Julian Casablancas (of The Strokes) when I was 17, and we played this venue in St. Louis called The Pageant. I don’t know what it was about it but it was such a cool place to play. It was the biggest place we had played at that point, so we were completely starry-eyed. In the artists lounge area, there are pictures of the owner with every band he thought was worth taking a picture with, and that night he asked us to be on the wall. It was our ‘made it’ moment. We’re about to go on tour with Vampire Weekend for a week and a half—I’m literally pinching myself. I’m so confused about my life! It’s crazy. We’re playing at Red Rocks in Colorado soon, and it looks like the most amazing place. I’ve always wanted to play there and I was so excited to see it on the tour schedule. It sounds like your life is pretty awesome. I pinch myself everyday. We have been working so hard for the past seven years to get out of L.A., and it really has been the most amazing ride. My fear before was that nothing was going to happen, and my fear now is that it’s all going to stop.